We are currently gathering information to update the church database and we will be producing a new Parish Directory (the 'Pink Book') from the information gathered as soon as we can. So, if you are part of St Peter’s Church then this applies to you! 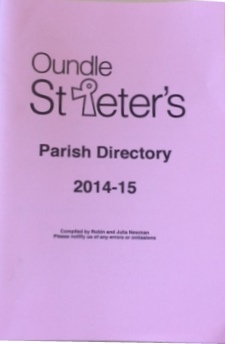 If you have been in the Parish Directory previously, we would still like you to fill in the form so that we can be sure we have all your updated information on file. We will not be automatically transferring information into the database from the 'Pink Book'. What do you do if you don't want to be in the Parish Directory? Please still fill in a form as we are gathering more information then just your contact details. Then, where indicated, you can tick if you do not want your information to be included in the paper or online version. Your form will be held in the office for office use only and under no circumstance will we divulge this information without your prior consent. The online version will only be accessible to people within the directory, and will be password protected, this should be available later on in the year. The paper version will be available to all of St Peter's congregation (from all services). Please complete this form for your household, ask each adult (18+) to sign it, and return it to the Church Office no later than Friday 10th February 2017. Please click here for a copy of the sheet. Paper copies are also available at the back of Church.